Being an avid extreme adventurist, my New Year is always full of goals and I bet yours is too! From mental preparation to training techniques and performance suggestions, I will be sharing my New Year strategies as I pump it up a notch to prepare for my up and coming endeavors. My biggest challenge isn’t necessarily the hours I spend training for an event or the physical and mental torture of the event itself, my biggest challenge is juggling the hours of dedication extreme adventure sports require with my personal life. There is nothing I treasure more than time with my family. Recently I enjoyed a ski trip to Colorado with my family. 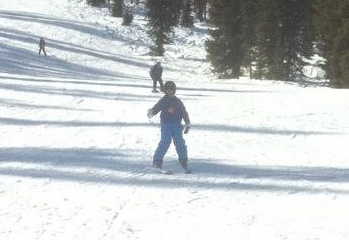 As you can see in the picture above, my son took right to the slopes! To be able to take time out to enjoy my family and run my online businesses, time management is a big part of my game plan. If you have ever thought it would be easier to be a professional athlete than one who must struggle to find time to train, you are going to love my time saving tips and suggestions on getting the most from your training. Great equipment and excellent nutrition and supplements will enhance the time you are able to spend in your workout. I will be adding lots of new information on the site so be sure to check it out. February 24-26 is the Cowtown Marathon. I’m looking forward to competing right in my backyard. 2012…IT’S GOING TO BE A GREAT YEAR!